The iliolumbar ligament is a strong band of connective tissue and one of the three vertebropelvic ligaments. the others being the sacrotuberous and the sacrospinous ligaments. They help stabilise the lumbosacral spine on the pelvis. 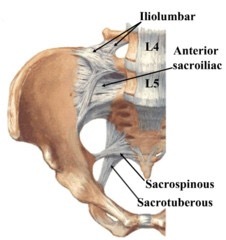 The iliolumbar ligaments are crucial in supporting the lower lumbar spine; they join the 4th and 5th lumbar vertebrae (L4 and L5) to the iliac bone crest at the back of the pelvis. Injury to this area, fairly common among certain athletes due to the amount of frantic spinal motion involved in many sports, can develop into sacroiliac joint pain and associated problems. The sacroiliac joint is located in the pelvis and helps to keep the spine stable. The main part of ILL originates from L5 transverse processes. insert was shield by crest dorsally,making it inaccessable to palpation. It plays an important role in restraining movement in lumbosacral and the sacroiliac joints. The ililumbar ligament strengthen the lumbosacral joint assisted by the lateral lumbosacral ligament, and, like all other vertebral joints, by the posterior and anterior longitudinal ligaments, the ligamenta flava, and the interspinous and supraspinous ligaments. patient is placed in prone lying with the hip joint in slight extension. Pressure is then applied over the ligament as it extends from the transverse process of the fifth lumbar vertebrae to the iliac crest . Tender point(s) along the posterior iliac crest — must cause concordant low back pain when pressed, otherwise it is just soft tissue pain from overzealous pressure by the examiner. Acute cases may resolve with relative rest, ice, and analgesics. Chronic cases frequently need injections of local anesthetic (and sometimes steroid) along that posterior iliac crest. When you are pain free, consult your doctor or a physical therapist about an appropriate program of stretching and strengthening exercises for the buttocks and hips. This is crucial in building up strength and support for the lumbar spine in order to prevent similar future injuries, and for maintaining smooth movement in the injured areas. The doctor might also prescribe a course of medication for this purpose. ↑ Am J Phys Med Rehabil. 1996 Nov-Dec;75(6):451-5.fckLRAnatomy of the iliolumbar ligament: a review of its anatomy and a magnetic resonance study.fckLRRucco V1, Basadonna PT, Gasparini D.
↑ [CT axial imaging of the iliolumbar ligament and its significance on locating lumbosacral vertebral segments].fckLR[Article in Chinese]fckLRLiu KC1, Xiang GZ, Chen GH, Zhou Y, Cao XQ, Xia JD, Li K.
↑ Palastanga, Nigel; Field, Derek; Soames, Roger (2006). Anatomy and Human Movement: Structure and Function. Elsevier Health Sciences. pp. 332–333. ISBN 0-7506-8814-9. ↑ 13.0 13.1 CONDITIONS - MAIN MENU, ILIOLUMBAR SYNDROME / BY CHRISTOPHER FAUBEL, M.D. / ON DECEMBER 12, 2011 AT 8:37 PM / Download article as PDF By Chris Faubel, M.D.